By Harry Dacres-Dixon in VectorVest on 29th August 2018 . Founded in Bath, UK in 1988, AIM listed 1pm Plc (OPM.L) is an alternative finance provider to the SME sector. OPM provides Lease Finance, Hire Purchase, and Business Loans to small and medium-sized enterprises (SMEs) via a network of brokers across the UK. The Company offers tailored finance packages to suit customer requirements. Ahead of its FY results announcement scheduled for Sept 12 2018, on June 27th 2018 OPM published a trading update. The Company said that final results will show a record year on year increase in revenue and profit, along with an increase in EPS in excess of 20%. FY revenues are expected to be 75% higher at £30m, while the blended cost of borrowing will be reduced to less than 4% (2017: approx 5.3%) and will reduce further as the facility with British Business Bank is utilized. In late July 2018, the key VectorVest RT (Relative Timing) metric (a fast, smart indicator of a stock price trend) for OPM moved sharply higher and over 1 as the stock headed toward 6 month lows at 43p. The remainder of July and August witnessed a sharp push higher for the OPM RT metric, through to today’s reading of 1.44 – excellent on a scale of 0.00 to 2.00. This move has been accompanied by corresponding share price growth, with the stock also registering a good GRT (Earnings Growth Rate) rating of 14%. Cautious investors may want to wait to see further validation of this move higher, but even so VectorVest logs a valuation of 67p per share against today’s 53p. 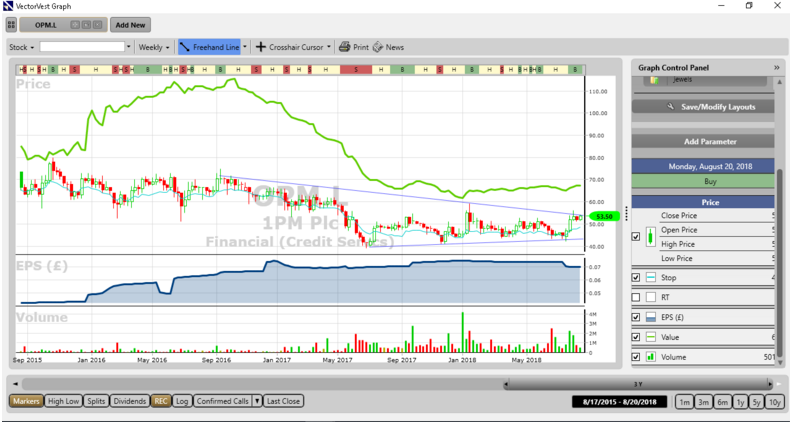 A weekly price chart of OPM.L is shown above over a period of 3 years showing the potential turnaround situation. The Earnings per Share (EPS) is shown as the blue line study on the window below the price. The latter has increased strongly over the past three years while the share price has traded in a range defined by the trendlines on the chart and in the process charted a treble bottom formation. Over the past month the share has risen in rising volume which is a positive signal. The share is on a BUY recommendation on VectorVest with a technical target similar to the valuation of 70p. Cautious investors should wait for a weekly close above the upper trendline shown on the chart. Once again, the VectorVest stock analysis and portfolio management platform has identified a niche financial sector operator as a potential growth company. Arguably the VectorVest metrics have flagged up OPM earlier than previous sector recommendations, and therefore cautious investors may decide to look elsewhere. But it’s the early bird that catches the worm, and for adventurous investors, VectorVest believes that OPM offers an attractive investment proposition with near to mid term upside.